My models tend to be an entity class that is mapped to the database table. Should the model object have all the database mapped properties as well as the code above or is it OK to separate that code out that actually does the database work? Will I end up having four layers? Disclaimer: the following is a description of how I understand MVC-like patterns in the context of PHP-based web applications. All the external links that are used in the content are there to explain terms and concepts, and not to imply my own credibility on the subject. The first thing that I must clear up is: the model is a layer. Second: there is a difference between classical MVC and what we use in web development. Here's a bit of an older answer I wrote, which briefly describes how they are different. The model is not a class or any single object. It is a very common mistake to make (I did too, though the original answer was written when I began to learn otherwise), because most frameworks perpetuate this misconception. Neither is it an Object-Relational Mapping technique (ORM) nor an abstraction of database tables. Anyone who tells you otherwise is most likely trying to 'sell' another brand-new ORM or a whole framework. A domain object is a logical container of purely domain information; it usually represents a logical entity in the problem domain space. Commonly referred to as business logic. This would be where you define how to validate data before sending an invoice, or to compute the total cost of an order. At the same time, Domain Objects are completely unaware of storage - neither from where (SQL database, REST API, text file, etc.) nor even if they get saved or retrieved. These objects are only responsible for the storage. If you store information in a database, this would be where the SQL lives. Or maybe you use an XML file to store data, and your Data Mappers are parsing from and to XML files. You can think of them as "higher level Domain Objects", but instead of business logic, Services are responsible for interaction between Domain Objects and Mappers. These structures end up creating a "public" interface for interacting with the domain business logic. You can avoid them, but at the penalty of leaking some domain logic into Controllers. There is a related answer to this subject in the ACL implementation question - it might be useful. How to interact with a model? Prerequisites: watch lectures "Global State and Singletons" and "Don't Look For Things!" from the Clean Code Talks. You can inject the required services in the constructors of your views and controllers directly, preferably using a DI container. Using a factory for services as a mandatory dependency for all of your views and controllers. As you might suspect, the DI container is a lot more elegant solution (while not being the easiest for a beginner). The two libraries, that I recommend considering for this functionality would be Syfmony's standalone DependencyInjection component or Auryn. Both the solutions using a factory and a DI container would let you also share the instances of various servers to be shared between the selected controller and view for a given request-response cycle. Your controllers have a very clear task: take the user input and, based on this input, change the current state of business logic. In this example the states that are changed between are "anonymous user" and "logged in user". Controller is not responsible for validating user's input, because that is part of business rules and controller is definitely not calling SQL queries, like what you would see here or here (please don't hate on them, they are misguided, not evil). Ok, user has logged in (or failed). Now what? Said user is still unaware of it. 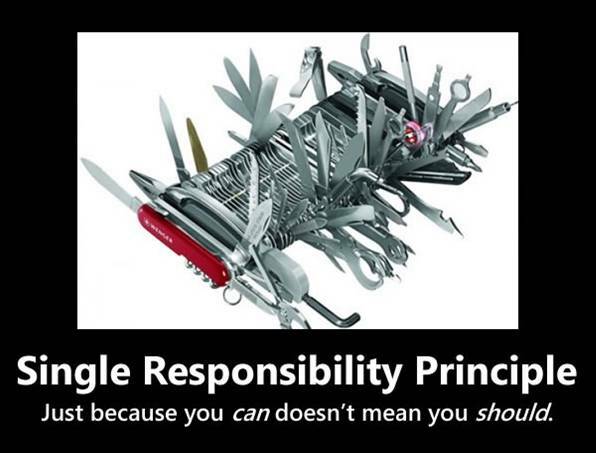 So you need to actually produce a response and that is the responsibility of a view. In this case, the view produced one of two possible responses, based on the current state of model layer. For a different use-case you would have the view picking different templates to render, based on something like "current selected of article" . The presentation layer can actually get quite elaborate, as described here: Understanding MVC Views in PHP. But I am just making a REST API! Of course, there are situations, when this is a overkill. It means, that, when your presentation layer's logic is close to none-existent, the pragmatic approach is to keep them as single layer. It also can substantially simplify some aspects of model layer. While this is not sustainable, when you have complicate logic for rendering a response body, this simplification is very useful for more trivial scenarios. But be warned, this approach will become a nightmare, when attempting to use in large codebases with complex presentation logic. How to build the model? Since there is not a single "Model" class (as explained above), you really do not "build the model". Instead you start from making Services, which are able to perform certain methods. And then implement Domain Objects and Mappers. As you can see, at this level of abstraction, there is no indication of where the data was fetched from. It might be a database, but it also might be just a mock object for testing purposes. Even the data mappers, that are actually used for it, are hidden away in the private methods of this service. To implement an abstraction of persistence, on the most flexible approaches is to create custom data mappers. In practice they are implemented for interaction with specific classes or superclasses. Lets say you have Customer and Admin in your code (both inheriting from a User superclass). Both would probably end up having a separate matching mapper, since they contain different fields. But you will also end up with shared and commonly used operations. For example: updating the "last seen online" time. And instead of making the existing mappers more convoluted, the more pragmatic approach is to have a general "User Mapper", which only update that timestamp. Information used by a single Domain Object might be mapped from different tables, while the object itself has no persistence in the database. Example: if you are generating a monthly report. This would collect information from different of tables, but there is no magical MonthlyReport table in the database. A single Mapper can affect multiple tables. Example: when you are storing data from the User object, this Domain Object could contain collection of other domain objects - Group instances. If you alter them and store the User, the Data Mapper will have to update and/or insert entries in multiple tables. Data from a single Domain Object is stored in more than one table. Example: in large systems (think: a medium-sized social network), it might be pragmatic to store user authentication data and often-accessed data separately from larger chunks of content, which is rarely required. In that case you might still have a single User class, but the information it contains would depend of whether full details were fetched. Example: you have a news site with a shared codebased for both public-facing and the management software. But, while both interfaces use the same Article class, the management needs a lot more info populated in it. In this case you would have two separate mappers: "internal" and "external". Each performing different queries, or even use different databases (as in master or slave). View instances in MVC (if you are not using the MVP variation of the pattern) are responsible for the presentational logic. This means that each View will usually juggle at least a few templates. It acquires data from the Model Layer and then, based on the received information, chooses a template and sets values. One of the benefits you gain from this is re-usability. If you create a ListView class, then, with well-written code, you can have the same class handing the presentation of user-list and comments below an article. Because they both have the same presentation logic. You just switch templates. You can use either native PHP templates or use some third-party templating engine. There also might be some third-party libraries, which are able to fully replace View instances. What about the old version of the answer? The only major change is that, what is called Model in the old version, is actually a Service. The rest of the "library analogy" keeps up pretty well. The only flaw that I see is that this would be a really strange library, because it would return you information from the book, but not let you touch the book itself, because otherwise the abstraction would start to "leak". I might have to think of a more fitting analogy. What is the relationship between View and Controller instances? 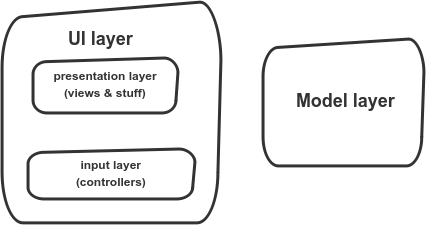 The MVC structure is composed of two layers: ui and model. The main structures in the UI layer are views and controller. When you are dealing with websites that use MVC design pattern, the best way is to have 1:1 relation between views and controllers. Each view represents a whole page in your website and it has a dedicated controller to handle all the incoming requests for that particular view. For example, to represent an opened article, you would have \Application\Controller\Document and \Application\View\Document. This would contain all the main functionality for UI layer, when it comes to dealing with articles (of course you might have some XHR components that are not directly related to articles). Everything that is business logic belongs in a model, whether it is a database query, calculations, a REST call, etc. You can have the data access in the model itself, the MVC pattern doesn't restrict you from doing that. You can sugar coat it with services, mappers and what not, but the actual definition of a model is a layer that handles business logic, nothing more, nothing less. It can be a class, a function, or a complete module with a gazillion objects if that's what you want. Also, in PHP, you rarely need to catch/rethrow exceptions because the backtrace is preserved, especially in a case like your example. Just let the exception be thrown and catch it in the controller instead. In Web-"MVC" you can do whatever you please. The original concept (1) described the model as the business logic. 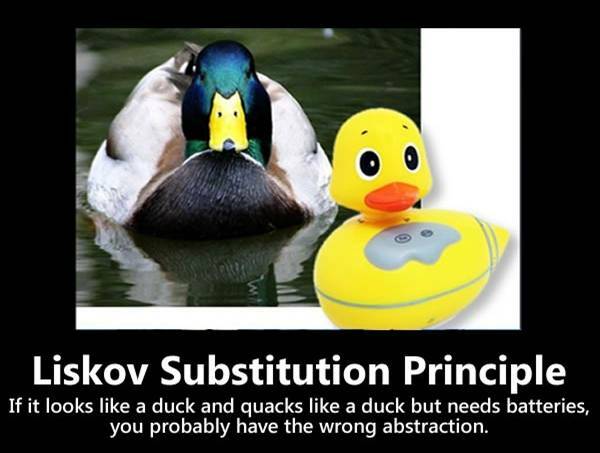 It should represent the application state and enforce some data consistency. That approach is often described as "fat model". Most PHP frameworks follow a more shallow approach, where the model is just a database interface. But at the very least these models should still validate the incoming data and relations. More oftenly most of the applications will have data,display and processing part and we just put all those in the letters M,V and C.
Model(M)-->Has the attributes that holds state of application and it dont know any thing about V and C.
View(V)-->Has displaying format for the application and and only knows about how-to-digest model on it and does not bother about C.
Controller(C)---->Has processing part of application and acts as wiring between M and V and it depends on both M,V unlike M and V.
Altogether there is separation of concern between each. In future any change or enhancements can be added very easily. In my case I have a database class that handle all the direct database interaction such as querying, fetching, and such. So if I had to change my database from MySQL to PostgreSQL there won't be any problem. So adding that extra layer can be useful. I hope this example helps you create a good structure. Not the answer you're looking for? Browse other questions tagged php oop model-view-controller architecture model or ask your own question. PHP: Should a Model in MVC be implemented as singleton? Is DAO the same as Model when working in MVC structure? How can I implement an Access Control List in my Web MVC application? Architecture more suitable for web apps than MVC? What is the right way to handle $_POST data in MVC? Models in Symfony2, and other MVC frameworks? How to use MVC domain model in a 4 layer project?